Dragon Boy Li Ripped Off! Dragon Boy Li Ripped Off! Dragon Boy Li Ripped Off! 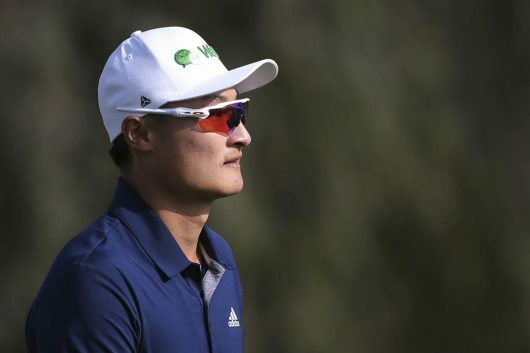 China’s defending champion Li Haotong (pictured) was ripped off by a two-stroke penalty at the final hole of the Omega Dubai Desert Classic. Though his caddie had moved away before Li completed his stance, European Tour officials still decided the Chinese player had breached the rule. As this was a brand new rule, the European Tour officials could have done with a warning instead of hitting Li with a penalty. According to on-lookers, Li’s caddie had moved away before Li completed his stance, but regardless, the European Tour officials still decided the Chinese player had breached the rule. The penalty turned a birdie into a bogey at the par-five 18th. Instead of finishing equal third at 16-under — which would have netted him nearly US$155,000 — Li dropped into a tie for 12th, which comes with about a US$51,600 purse.